Time for a different kind of nerdy cookies, the gamer sort. I actually have all these consoles in my house (and several older systems). I figure owning them all is socially acceptable since I am still my 20s (just barely). Though I won't pretend that I am in any way a skilled gamer. For example, I'm that person in Halo who gets confused by the controls and just spins around while other people walk up and throw grenades at them. Yea, I'm that person. Since having a child, my gaming has been limited to doing yoga on my Wii Fit. So the cookies, this was my first attempt at making controller cookies. Usually I don't post the practice-cookies on the blog but these were neat enough that I'll go ahead and post pics. Usually when trying out a new cookie I do a couple test batches, work out all the kinks and settle on a design. With these, there was so many steps with long drying periods between each that I wasn't feeling up to starting another batch last night. For now, the beta-cookies will have to do. So here we go: PS3, Xbox and Wii controllers (click for a larger version). They need more careful icing next time, so they look more polished. I usually ice my practice cookies rather quickly, so next time I attempt these they'll have a more refined look. I do like the texture of the thumb pads on the PS3 controller. Though I won't do that next time on the Xbox D pads, since they are smooth. I also think I may apply a little silver luster dust to the metalic X box logo next time. To make these, I used my normal sugar cookie and icing recipes (linked here). I also used a little dark gray sanding sugar. To make the cookies I free hand cut out the shapes, then baked them and allowed them to completely cool. I then outlined each and flooded them with the controller appropriate colored icing. I allowed the flooding to dry for several hours and then pipped on buttons, sprinkling the D pads with gray sugar. After all that had set, I piped on the remaining details. I also want to make a classic NES controller next time, just because I am feeling nostalgic for those childhood thumb calluses. Those are sooo cool!! My husband would love it if he came home from work and I had made these! Thanks for posting! My kids would love these! So clever! LOL...you're making my 7yo aspiring scientist reconsider his career decisions :) Or perhaps like your Venn diagram indicates, he can be both a scientist and a baker? Jealous on the talent! God I want cookies! Wow, the power button on the Wii controller is amazing...I'd love to watch you pipe these details. Your fine motor skills are pretty impressive! Gosh - these are incredible! I'm a total gamer, it's ridiculous. Chuck in a Megadrive pad cookie and you've got me going. Can I eat the xbox controller? I just recently started following... you are amazing!! Can I make a request for cheese cookies? Your cookies are incredible! What kind of cheese, and I'm since I am curious... why cheese cookies? My personal venn diagram looks just like yours! Hey, I really like your gaming cookies. Thats a really good idea, I love baking and I have never thought of this. Maybe you'd be interested in the project we are doing. Its sort of like a nation wide book club. My blog gives a brief description but if you go to www.AnnotationSensation.Xanga.com. I really think you would enjoy it even if you only participate once. Whilikers! That's at least 10 times more amazing than I imagined! The buttons, the logos, the analogue sticks, incredible! I told you we would love them. i...love...them! ms humble...you're a genius. It would take me a ridiculous amount of time to do all that. I'm amazed! Wow !!! I love it !!!! Oh my God, those are amazing beyond words!!! I LOVE THESE! Best!Cookies!Ever! So creative of you! They look so cute and life-like! These look amazing! I can't wait to try them out! What a clever idea. These are so awesome! I'm loving your science cookies - you're inspiring me to do some nerdy ones for my hubby too (he's a electrical engineer/computer nerd). I have a feeling that mine will not look anywhere near as cool as yours! these are super fabulous! thanks for the tip... I'll post today on my column (ediblecrafts.craftgossip.com). brings me back to my cookie store days, oh so many orders for gamers and the like! Wow - those cookies are amazing! My family would love those! Maybe in the new year I could give it a try. Thank you for sharing! Ha, these are WONDERFUL!!! I will have to show my boys, they will love them (probably just as much as we all loved your Peppermint Mocha fudge!! : ) Happy Holidays! WHY am I just finding your blog? These are beyond awesome!!! Those are so cool! Love the idea. You did a great job! If these are just the test cookies, I can't wait to see the finished product! Wow. They are actually amazing! I hardly even need to blur my eyes at all and they look like the real thing! 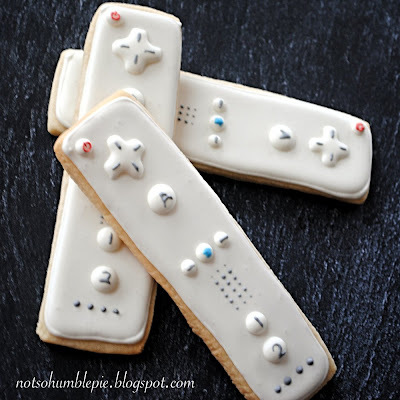 If I had the time, I'd make my little brother Wii controller cookies. These are entirely, completely, totally FANTASTIC! My son would LOVE them. I LOVE them. I showed my husband... He loves them. Who wouldn't love them. Omg those are extremely awesome. You're the best! So talented! These are one of the best cookies I have ever seen! Way better than the dominoes and such! You have totally brought the 'game' to a whole new level! Now THESE are cool, it's about time you set up your own shop dontcha think? How did you make the wiimote buttons? You say in your post that you piped them...did you use the royal icing and just make it super thick? I don't know how you made it into the dome. Yes, those buttons are just very thick blobs of royal icing piped on. You can also piped a circle, let it dry and then fill it with royal icing, if you're having trouble with your icing running. Thanks...I'll try the thick method. Hi, I have a question about the royal icing. When I decorate cookies they come out looking well, even if I don't achieve the correct consistency, but I notice that when the icing dries it ends up looking sparkly instead of matte. Is this how yours looks, or could it be something I'm doing? Sparkly? On the flooded areas? By sparkly do you mean that there is sort of a speckled, frosted look to them? If I thin my royal icing with too much water, I will get a patchy, frosted effect on my cookies when they dry. Most of my cookies have an even matte finish, the trick to this is getting the right icing consistency. Basically you need to use as little water as possible. A good rule of thumb is add a few drops of water to a cup of thick icing and then stir. Lift the spoon from the bowl and the peak it leaves behind should settle back into the icing within 5 seconds. If it doesn't, add a couple more drops of water and repeat until it does. That will clear up the icing's appearance, well... if I'm properly interpreting what you mean by sparkly. Yeah, the flooded areas sort of look like snow does the day after, slightly sparkly. When you mention adding too much water, that probably was my problem. I had a bit of difficulty achieving the proper flooding consistency. In the end I think it was thicker than I wanted (because I had to coax it with a spoon), and when it dried it wasn't matte. Thanks for the tip, I'll remember the 5 second rule! Could it also have been that I left them out overnight instead of covering the cookies? I leave my cookies out to dry overnight too, so that probably isn't the issue. May I ask what your recipe for royal icing is? I am sure they are going to devoured by the gamers as they hungrily eat up all the games.These look very lovely..true to real life. cookies look amazing, very good piping skills too.